created for your HR teams. Beyond their immediate leadership, an employee's only true connection with the organization is the HR team. Taking care of employees reduces operational costs, improves revenue growth, and builds leadership within the organization. As your organization grows, your HR team will be faced with an increasing number of questions and requests. To make sure that they don't end up spending all of their time answering repetitive questions, you can use help desk software. This will free up their time and ensure that they deliver human assistance where absolutely required. What HR processes can help desk software be used for? Sift through job applications effortlessly by creating easy web forms for your candidates to fill out. 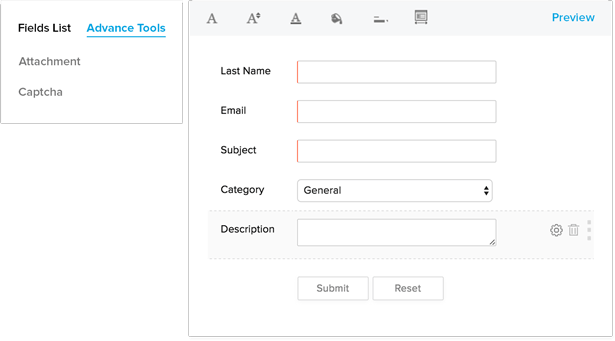 Each of these forms is automatically created as a separate ticket, with details about the candidate and a history of previous interactions available as well. This automates the first and most important step of the hiring process and ensures efficiency. You can even use these web forms to make the employee referral process simpler and faster. Each time your employees are faced with a question, the first thought that pops into their head is to . As your HR faces these increasingly repetitive questions, frustration mounts over their inability to focus on other tasks. The easiest solution to this is to have an FAQ porftal where they can quickly look up answers for themselves. 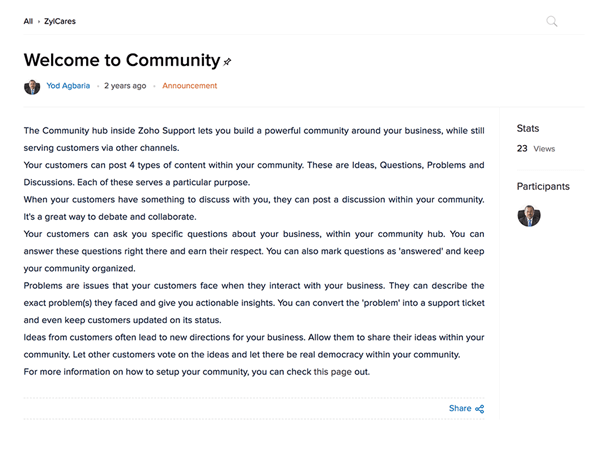 You can even list your policies and guidelines here, and make them available to your employees through a branded, customizable self-service help center. 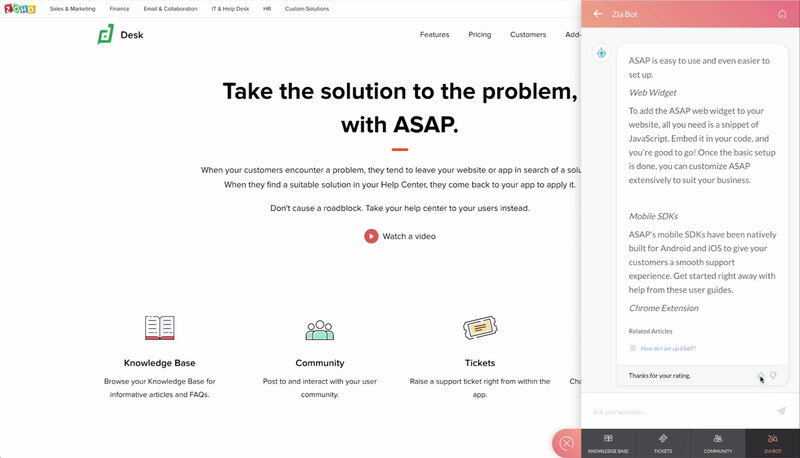 Embed an entire help center into your website or mobile app with Zoho Desk and make your team more virtually approachable. 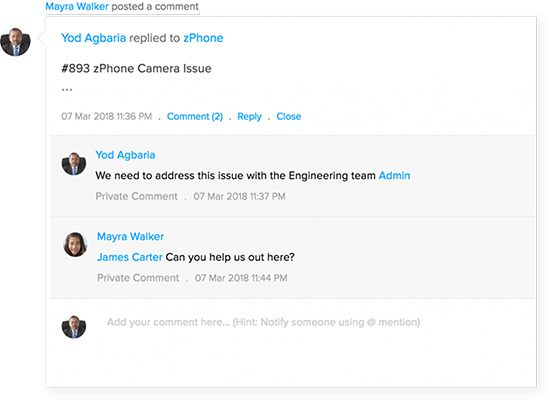 Using ASAP, your employees can obtain quick answers from the AI-powered chat bot, engage each other in discussions in the Community and even raise a ticket that would go straight to the HR team if answers are not found. For any queries that require the payroll and finance team to pitch in, you can add them as light agents. This way, they will be able to see all the contents of the ticket and offer solutions in the comments. 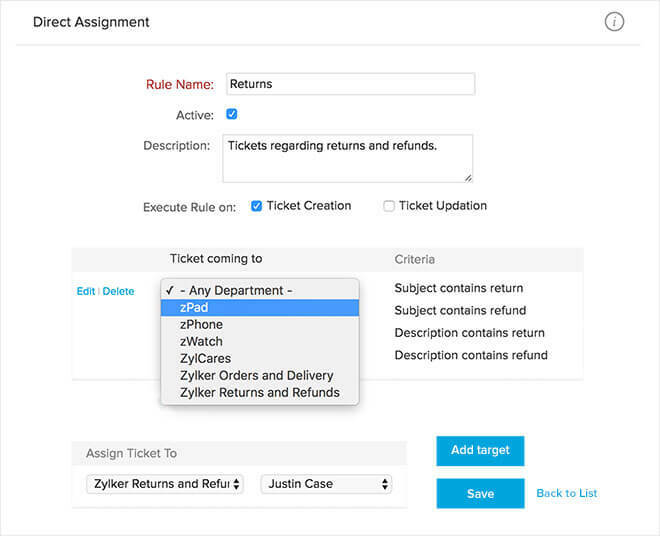 To tag them in a ticket, your team only needs to @mention them–it's that simple! Create workflow rules for sending alerts to employees who default on work invoices, tax declarations, and proof submissions. You can even create escalations that are triggered when the ticket isn't resolved or has been left unattended for too long. Your team thus alerted, can swoop in and do damage control when necessary. The happiness of your employees is crucial to the success of your business. 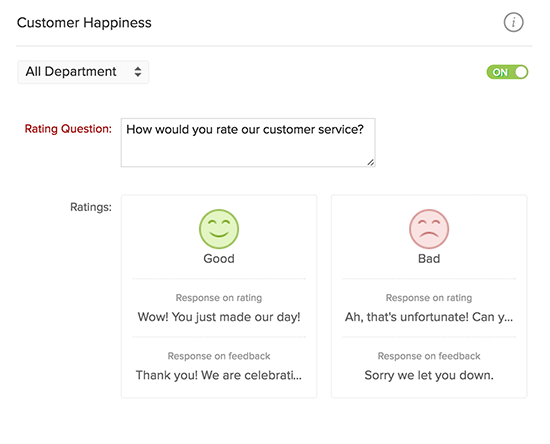 Each time a ticket is resolved, you can send out a feedback form and ask for happiness ratings. The dashboard gives you a consolidated report on all the happiness ratings, so that your team can get the gist of employee happiness. The help center comes equipped with an online forum, where employees can answer each other's questions. And since confidentiality in certain matters is crucial to the HR ecosystem, you can even create a dedicated FAQ portal with restricted access. This portal containing private FAQs will only be visible to the HR team for more subjective advisory topics. For requests that are less common, you can create a group email ID that your employees can quickly dispatch an email to. Zoho Desk is the perfect solution. This help desk software packs a bunch of features designed specifically for Human Resource professionals.